When Michael Jordan retired from basketball for the first time in 1993, many thought the Chicago Bulls were doomed. The Bulls went on a great run with 3 straight NBA Championships with Jordan as the face of the franchise, and with the loss of the greatest player to ever play the game, many felt that the Bulls were destined for failure. For Scottie Pippen, that wasn't an option. There was talk that in this Eastern Conference, that a Jordan-less Bulls would not win 50 games, let alone secure a top tier playoff spot. The Orlando Magic, the Atlanta Hawks, the New York Knicks, and the Indiana Pacers seemed to stand in the Bulls' path of getting anywhere without Jordan, and considering the year before they didn't capture the no. 1 seed WITH Jordan (they would go 57-25 in 1992-93), it seemed really likely that the Bulls would suffer a huge drop in success. 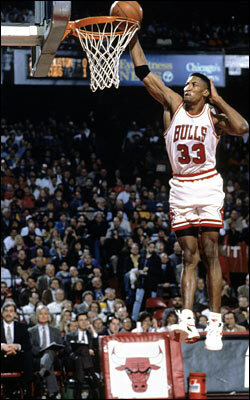 Scottie Pippen had other plans. 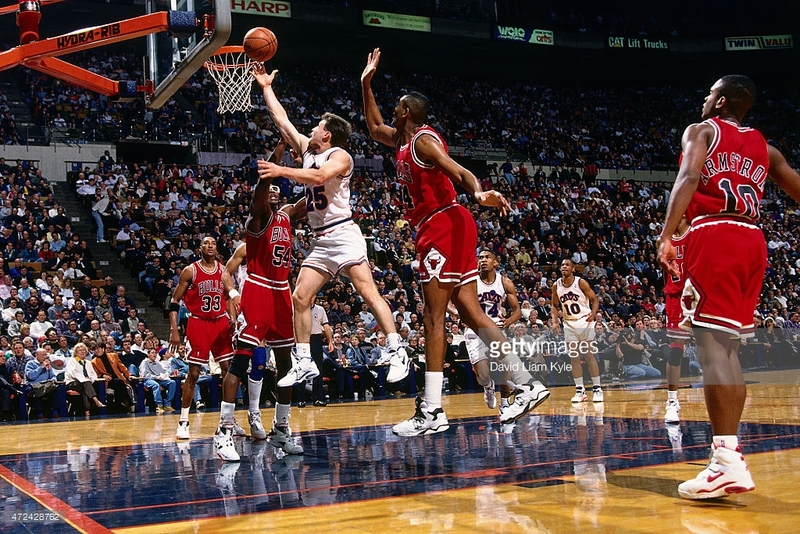 As the season kicked off, the Bulls acquired Pete Myers and Steve Kerr, Luc Longley, and gave Pippen, Horace Grant, Tony Kukoc, and BJ Armstrong even bigger roles for the team. Scottie Pippen was now the no. 1 option for the team. 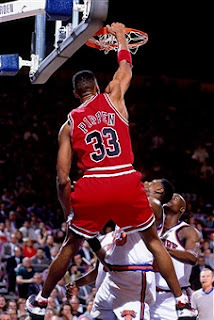 Though this was an unfamiliar role, as the season kicked off, it was clear that Pippen was up to the challenge. He kicked off the season leading the team to a victory over the Charlotte Hornets with a 124-123 in an overtime thriller, as he put up 23 points, 16 assists, and 7 rebounds. It was the first time we would see how good Pippen could be as a leader, and throughout the season, we'd see more of that in a lot of solid performances. His best performances on the year would include putting up two triple doubles during a 10 game winning streak in December to help improve the Bulls' record after they struggled a bit in the first 15 games of the season without Pippen playing in 10 of those games due to an ankle injury. The fact that the biggest stretch for the Bulls where they experienced a downswing came when Pippen was out for those games showed his importance to the team. 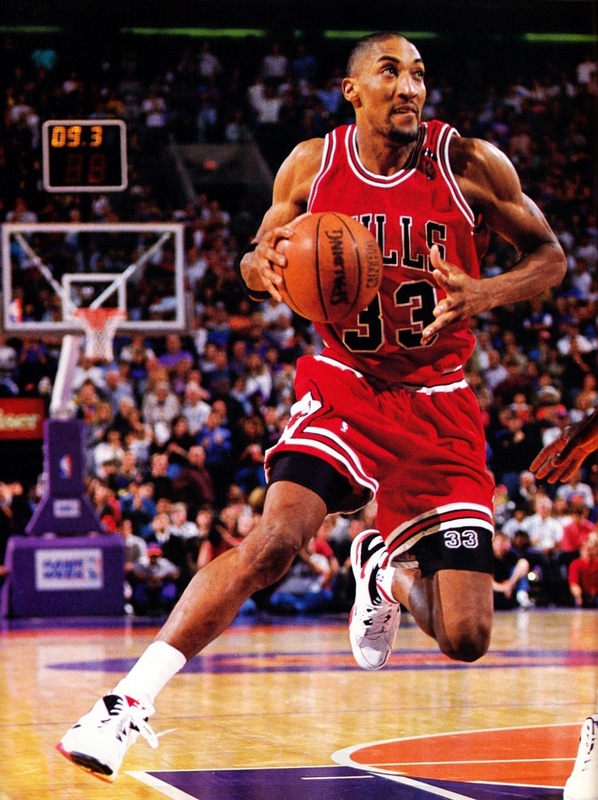 Pippen helped lead them to 30 wins in 35 games after he returned before the All Star Break. With a 32-13 record at the All Star Break, the Bulls were looking more like the team that won 3 Championships in a row, and Pippen was carrying the biggest load for the team. It was at the All Star Game where his campaign for the MVP Award was solidified. 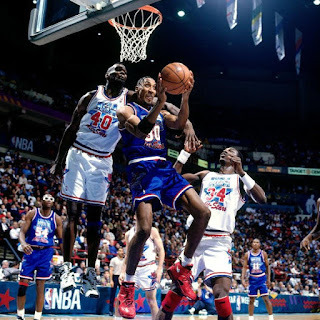 Joined by teammates BJ Armstrong and Horace Grant at the All Star Game, Pippen was having the year of his career, and it was capped off with a huge victory to lead the East over the West with 29 points, 11 rebounds, and 4 steals (they used to play defense in the older All Star Games). 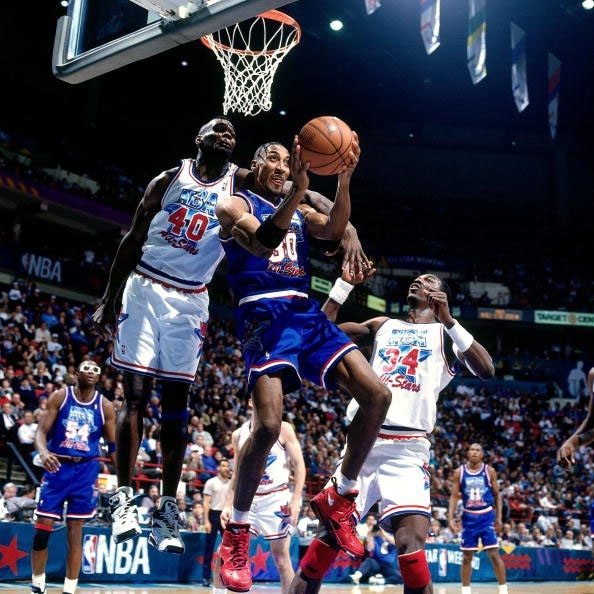 This effort from Pippen was enough to secure him the All Star MVP award, showing that he was no longer second fiddle or the backup for Michael Jordan, but he was his own player and the leader of the Bulls team. 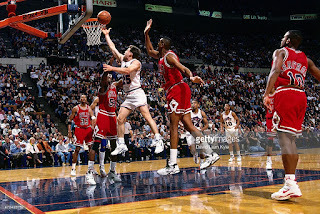 Grant contributed, Kerr took some good shots, Kukoc went harder, and Armstrong stepped up as well, but with Pippen to lead the team, that Bulls team would have struggled to have a record over .500, let alone make the playoffs. What Pippen did in this season cannot be slept on, and it is probably one of the most under appreciated seasons of the last 25 years in the NBA. After the All Star Break, the Bulls went 23-14, and ended up with a very solid 55-27 record, going 24-17 on the road, and a solid 31-10 at home. 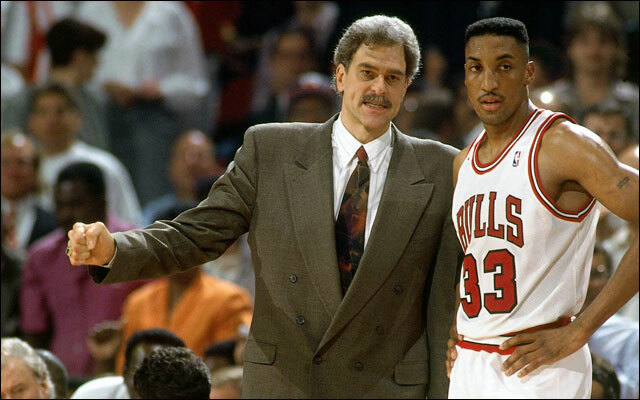 That success is really all because of Pippen, who averaged a career high 22 points a game, 8.7 rebounds a game, 5.6 assists, and 2.9 steals, which was good enough to finish 2nd in the league for steals. 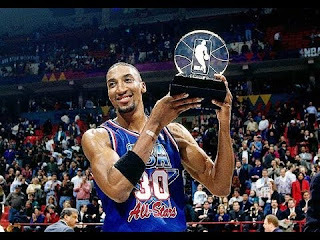 If Hakeem Olajuwon hadn't had one of the best seasons of the 90's, I don't think it's a question that Scottie Pippen should have been the MVP. Even still, there's an argument to be made for Pippen this season. He didn't average as much as Hakeem on the boards, blocks, or with points, but for a man to lose the best player in the world and lead his team to the 3rd seed and only 2 games less than they had the previous year (considering Pippen missed 10 games, it's a chance that his totals and the Bulls record could have had hit 60 games and won the East if he hadn't missed those). That's a MVP feat in itself and with Pippen being the leading vote getter for the All NBA First Team, the All Star MVP, and All Defensive First Team, this was his greatest season and achievement as a player (without Jordan). 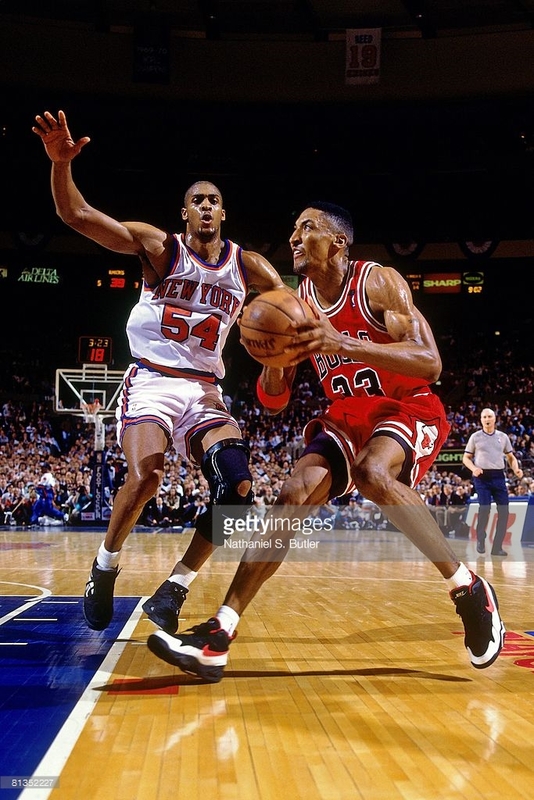 Pippen was in his prime, and showcasing that he was capable of being "the guy" in Chicago. When the playoffs rolled around, I believed that there was only thing that stood in the way of the Bulls making their 4th straight Finals: The New York Knicks. The Hawks were the no. 1 seed, but they didn't seem to be legit (as always), and the Pacers and Magic didn't seem to have what it took to defeat the will of Pippen and the Bulls in the playoffs. With the Knicks being the 2nd seed and the Bulls being the 3rd seed, it was a chance they would meet up in the Semifinals, and I knew that whoever won that series would end up taking the East. After the Bulls swept the Cleveland Cavaliers, the Knicks and Bulls were due for a matchup. Some experts said the Knicks would win in 5, others in 6, but it was expected that this Knicks team, who was seen as the true best in the East now that Jordan was gone. With that in mind, the Bulls went as hard as they could against the Knicks, who seemed to be a team of destiny this year. 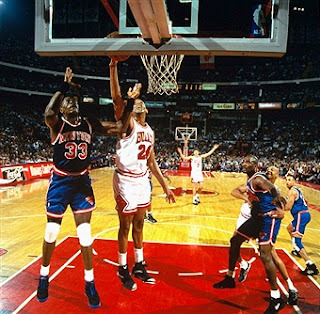 The Knicks would win the series in 7 hard fought games, but the fact remains, Pippen carried his team to being just one game away from a shot at winning the Eastern Conference. If the Bulls get beyond the Knicks, as I said earlier, I think they win the East and make the Finals (and they could have pulled off a possible upset over the Rockets, though I'd see them losing in 6 in reality). Regardless, Finals or no Finals, considering the fact that no one imagined the Bulls being as dominant as they were and Pippen being a top choice for MVP that year, this has to be considered a very successful season for the Bulls. 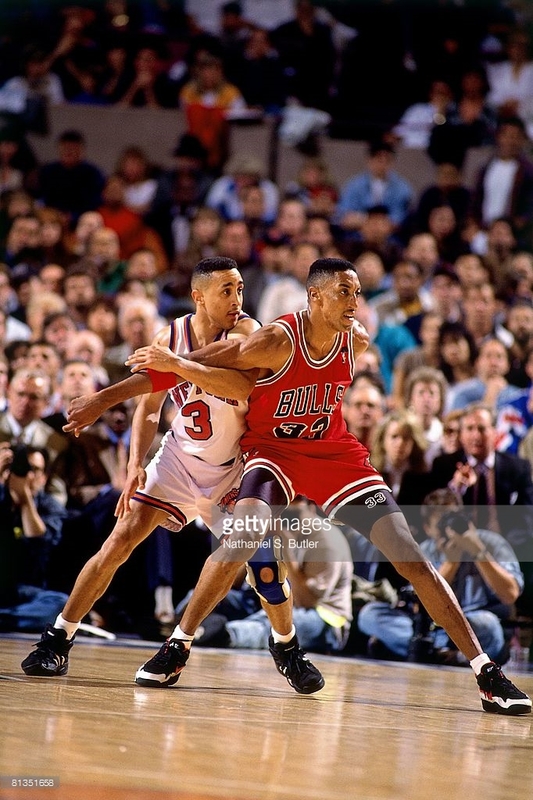 They made adjustments without the best player, and latched on to the power of Pippen and his defense to carry them to prominence and they were THIS close. Pippen finished his year with 31 double doubles, 2 triple doubles and led the Bulls to their 5th straight 50 win season, which is amazing considering the fact that he lost the greatest player to ever play the game. He would be immortalized for his huge dunk in Game 6 of the Semifinals against the Knicks on Patrick Ewing, which would be the exclamation point for an amazing season. Finishing third in the MVP voting behind Hakeem Olajuwon and David Robinson, Scottie was essentially the best player in the Eastern Conference this year, an accolade usually held by his former teammate (at the time) Michael Jordan. 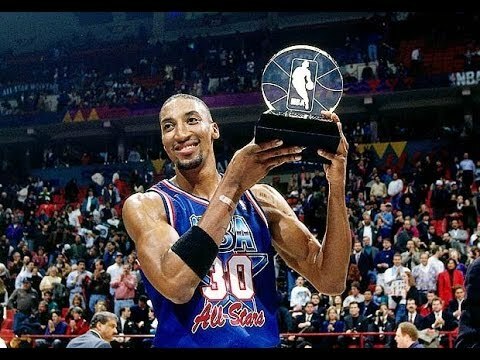 I think this season needs to be appreciated more and it solidified Pippen as one of the greatest Small Forwards to play the game (top 5 for sure). 1993-1994 might not have been another Bulls championship season, but it was the year we found out just how good Pippen really was.